Learn a bit about The Mile High City before you visit. Welcome to Denver, where 300 days of sunshine, a thriving cultural scene, diverse neighborhoods, and natural beauty combine for the world&apos;s most spectacular playground. 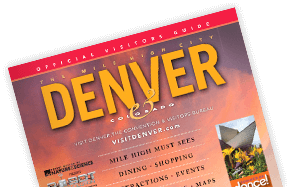 A young, active city at the base of the Colorado Rocky Mountains, Denver&apos;s stunning architecture, award-winning dining and unparalleled views are all here, year-round. Local boosters named the frontier mining camp on the South Platte River "Denver" after Kansas Territorial Governor James Denver in hopes of gaining political favor. Unfortunately, Denver had retired by the time they named the town. There were originally three separate towns, with three separate names, where Denver now stands. In 1859, the other names were dropped in return for a barrel of whiskey to be shared by all. Fittingly enough, the first permanent structure in Denver was a saloon. By an amazing stroke of good luck, the 13th step on the west side of the Colorado State Capitol Building is exactly 5,280 feet above sea level - one mile high. In Denver&apos;s rarified air, golf balls go 10 percent farther. So do cocktails. Alcoholic drinks pack more of a punch than at sea level. The Mile High City is also extremely dry, so it is a good idea to drink more water than usual. With less water vapor in the air at this altitude, the sky really is bluer in Colorado. Denver has a population of 682,545 (2015 census) while there are 3 million people in the metro area. The region&apos;s population grew 14 percent between 2010 and 2015. According to the 2014 census, 31 percent of the city is made up of Hispanics while African-Americans make up 10 percent.